​Recently enacted state legislation restricts the use of phosphorus based fertilizers to new lawns and golf courses only. In addition, Bloomfield Twp Ordinance 621 monitors commercial fertilizer applicators in compliance with the new state law. For more information including a listing of lake-safe fertilizer applicators and retail outlets, visit the Bloomfield Twp. website (click here) or go to bloomfieldtwp.org and enter “FERTILIZER” in the search box. You may also contact the Bloomfield Township Water & Sewer Dept. at 433-7731. Please be aware that as riparians, the absolute best eco-friendly answer to the question of lawn fertilizer use is NOT TO USE ANY LAWN FERTILIZER weed growth, lesser water quality and algae blooms. Using lake water to irrigate your lawns and gardens assures a natural nutrient rich fertilization every time you water and it’s very cost effective! However, if you must use fertilizer, please choose a no phosphorus/slow nitrogen release formula and do not apply it within 25 feet of the lake. There are no specific readings or reports which are routinely performed to determine water quality. If someone is interested in taking on the duties to routinely measure our water clarity, please contact the SLA president. Occasionally, however, the Department of Health will take samples at the “public beaches.” For Square Lake, those measurements take place by the condos on the North East corner of the lake. It is a private beach, but because it serves multiple dwellings, they must test it periodically. If readings indicate high levels of ecoli, it will be posted on the announcements section of the website and notice will be emailed to those on the distribution list. There are no restrictions on time except for those associated with towing a passenger, which may only occur during daylight hours per state law. You must TRAVEL COUNTER CLOCKWISE when driving on the lake. Except for when you are picking up a skiier who fell, you should NEVER be traveling clockwise. That is like driving on the wrong side of the street. Please do not be offended if your neighbors call you on this rule -- it is essential to safety. See diagram at bottom of page to see the "traffic lane" and direction in which you should travel. The Oakland County Sheriff's Marine Patrol and Water Rescue Unit has responsibility for patrolling the lakes in Oakland County. You can reach them at 248-858-1664. They have twenty-three ​patrol boats, two rapid response jump boats, a hovercraft, six all-terrain vehicles, and four snowmobiles assigned to the unit manned by a 12 member, highly trained, dive and rescue team. The team has advanced technology gear and specialized training. It is recommended that anyone driving a watercraft on the lake become fully acquainted with the rules governing the operation of watercraft. There are two ways to do that: review the Boaters’ Safety manual and attend a class to obtain their boat safety certificate from the State of Michigan. 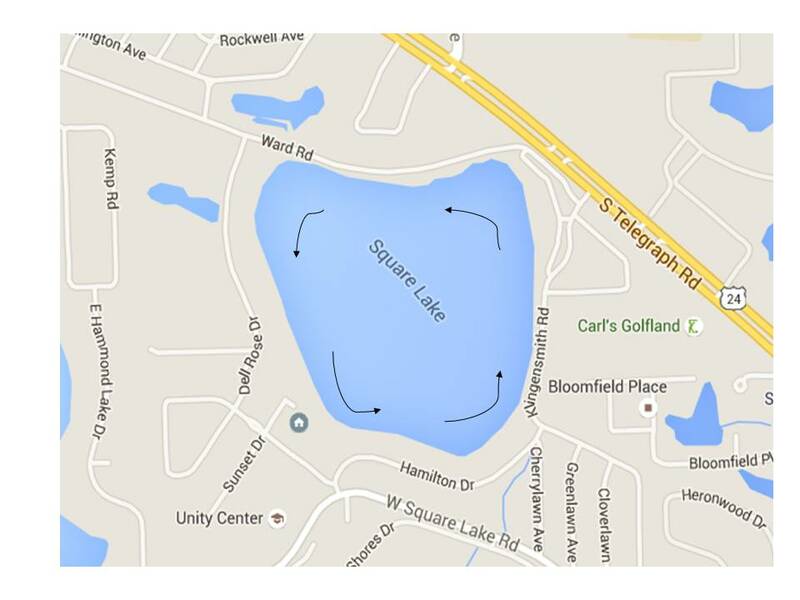 Rules exclude the use of jet-skis or other type of personal watercraft on Square Lake. Homeowners on the lake are allowed one motor boat over 25 hp per 110 feet of lake frontage. You may not launch more than one boat with a motor, even if it is just for the day. Boats on Square Lake must have an up to date sticker which is obtained from the head of the riparian committee (see officers here.) Once you have the sticker, you may launch your boat on Klingensmith at the Periyard boat launch for a nominal fee. Please contact Mrs. Periyard, who owns the boat launch by knocking on her door. Boats may not be launched unless they are titled in the name of a SLA homeowner. That is, you may not launch a boat belonging to a friend or relative. Please take care to set up your dock within your own property lines, preferably to the middle of your lot. No portion of your dock should cross the sight line from the edge of your property to the middle of the lake. See an interesting article "Is your neighbor’s dock on your bottomlands?" by clicking here. In addition to adhering to laws as they apply to all vessels, boat operators towing a person(s) on water skis, a tube, a surfboard, or a similar device must obey these laws. Every vessel towing a person(s) on water skis, a surfboard, or a similar device MUST HAVE A SPOTTER - a person, in addition to the vessel operator, observing the towed person(s) at all times. Click here to read what happened to a Sylvan Lake boater who towed without a spotter. Courtesy and safety should be exercised at all times by all of those on the lake. If you are swimming in the lake, please do not swim or float out on a raft in the lane that is typically used by boats towing skiers or tubers. The diagram below shows the typical "traffic lane" for motor boats. That is, either swim or float close to shore (within 50 feet) or swim in the middle of the lake, out of the traffic lane. This is also true for those on stand up paddle boards, fishing boats and kayaks -- Please stay out of the motor traffic lane. SEE DIAGRAM BELOW! This is as much for your safety as anything else: it is difficult for boaters to see swimmers. If you are swimming or snorkeling, make sure to have a large item floating on the surface near you to warn boaters of your presence. Advise your boarders or skiers to raise their boards or skis up once they drop to alert other boaters to their presence. Square Lake Association hereby disclaims any responsibility related to your interpretation of the regulations. You are ultimately responsible for knowing the rules as they exist under the Marine Safety Act. Call the Marine Unit 248-858-7831 if you have questions.